Among hikers, backpackers, campers, Scouters, and pretty much any outdoor enthusiast, one topic seems to always spark debate: hardware devices or knots? Are you a knot purist who sees hardware devices as redundant, a waste of time (or weight), or perhaps even an abomination that threatens the purity of primitive living skills? Or are you a “gear junkie” or “knot averse” who shuns knots like the plague, or looks at “knot heads” as backward, regressive, and maybe hard headed? I’m speaking hyperbolically, of course; I harbor no ill will with either group. In fact, I find myself somewhere in the middle, mostly: I love knots, and yet also find hardware devices extremely useful and sometimes a lot of fun to tinker with. Taut-line hitch with a slippery half hitch on the end. The slippery hitch makes it easier to untie. To be clear, these “good knots” still take time to learn and master. But more important is to know when and why certain knots can and should be used. Practice and experimentation pay off in dividends when you get out in the field. Knots, when tied right, are simple, elegant, and efficient. To tie a knot seems to be a simple thing, and yet there are right ways and wrong ways of doing it and Scouts ought to know the right way. Very often it may happen that lives depend on a knot being properly tied. The right kind of knot to tie is one which you can be certain will hold under any amount of strain, and which you can always undo easily if you wish to. The bad knot is one which slips away when a hard pull comes on it, or which gets jammed so tight that you cannot untie it. There are a lot of knots out there, but I’ve found that a few “workhorse” variety are all I’ve really needed for most tasks, particularly with hammocks and tarps. Two half-hitches—used to secure a guy line, among other uses. Taut-line hitch—great for adjustable tensioning of guy lines and even tarp ridge lines. Clove hitch—I use this often for bear bagging and as a stake tie-off for some tarps, like those made with low-stretch fabrics. Bowline—great all-purpose knot. I often use this on guy lines attached to a tarp. Often used as a harness for self and aided rescue. 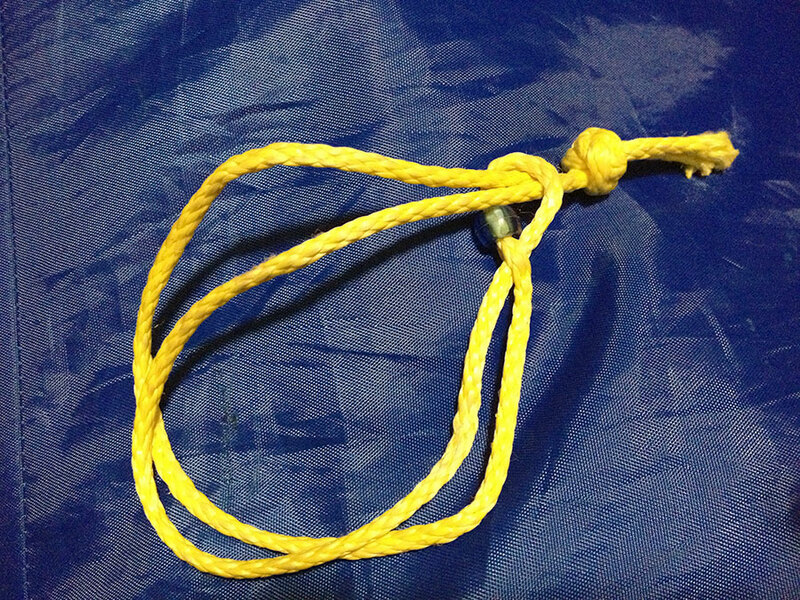 Lark’s Head knot—often used to attach suspension lines to hammocks or other eye loops over tie outs on tarps, etc. Very versatile. Prusik knot—Often used in climbing and rappelling for self belay, the humble prusik is a simple knot with a lot of uses, especially for a sliding adjustment. 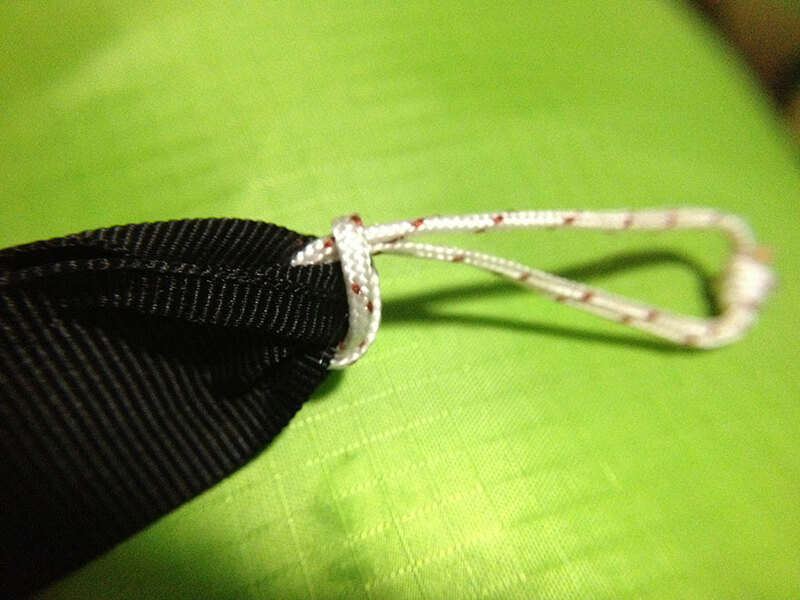 Becket hitch/Sheet Bend—The Becket hitch is the number one knot used to tie up hammocks in regions in South America. It is really easy to tie and release, and offers near infinite amount of adjustability. 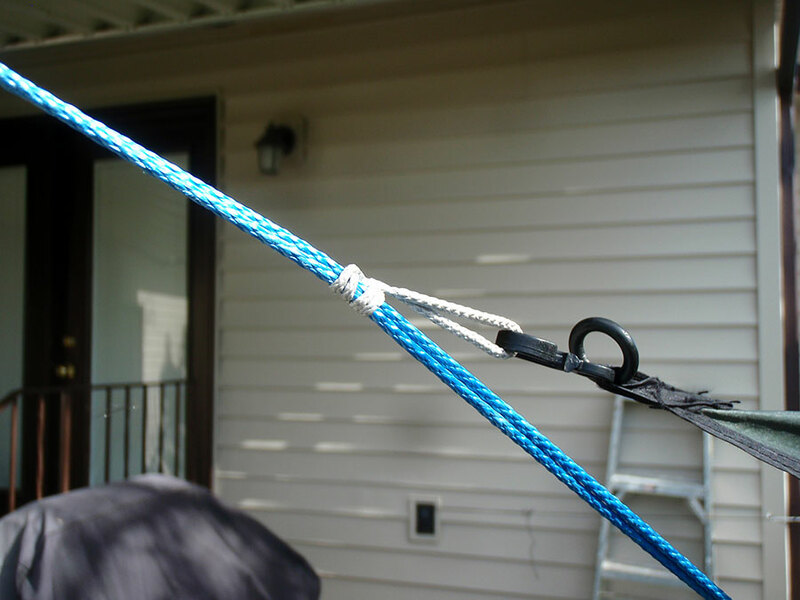 Using a loop on the end of a hammock and a long webbing strap is one of the lightest and simplest no-hardware hammock suspension system. I use a slippery version of the Becket hitch to make releasing even quicker. Some folks avoid knots because of a perception that they are hard to learn. The key to mastering knots is practice. As a Scoutmaster, I removed all the hardware helpers off tent guy lines as a way to help my scouts practice and learn a skill. A LoopAlien is a like a two-headed figure-8 belay device, but miniaturized and full of surprising uses. I believe that anyone going on a trek outdoors should know how to tie the basic knots listed above. Understanding these knots will help you improvise when hardware is not available, when it fails (which they do, especially the plastic variety), or when hardware is lost or forgotten, whether you are pitching a tarp or saving a life. That said, hardware devices can be wonderfully useful. They can decrease set-up times, make adjustments quicker and easier (particularly in cold weather or with gloved fingers), provide mechanical tensioning, and quick no-hassle attachment. I find hardware especially helpful when using thin, slippery line such as Dyneema (Spectra), which has been increasingly popular as a lightweight line, but it doesn’t hold knots well. The main function of the device must be obvious and inherent in the design. Secondary uses/functions are “discoverable” but should not get in the way of the main function or make it overly complex. The device should solve a real issue or challenge, such as improving dexterity, decreasing/eliminating slippage, improving efficiencies, increasing strength, providing mechanical advantage, minimizing weight, etc. The device should pack well when attached. Sharp points or burrs pose potential damage to fabric. The device should be reasonably lightweight, yet strong enough for its intended function. I think some hardware devices are solutions looking for problems, or present solutions that are overly complex or not necessary in the first place. If hardware claims to make things simpler and easier, then it should. Otherwise I don’t use it. When hardware can perform or improve tasks that knots alone cannot, they are at their best. When hardware gets in the way and makes a system more complex, they are at their worst. UPDATE: A lot of folks have been asking me to break the gallery out into individual photos since the gallery seems to be broken on some devices. I will try to add a few more hardware options in time as well, to show various options. This is by no means meant to be exhaustive, exclusive, or to endorse a particular product. The humble Lark’s head knot. I use this often to rig up hammocks and tarps. An eye splice (w/locked brummel) on the end of a line makes a handy connection point. Unlike knots, splices like this are not meant to be “undone” and are considered permanent fixtures. 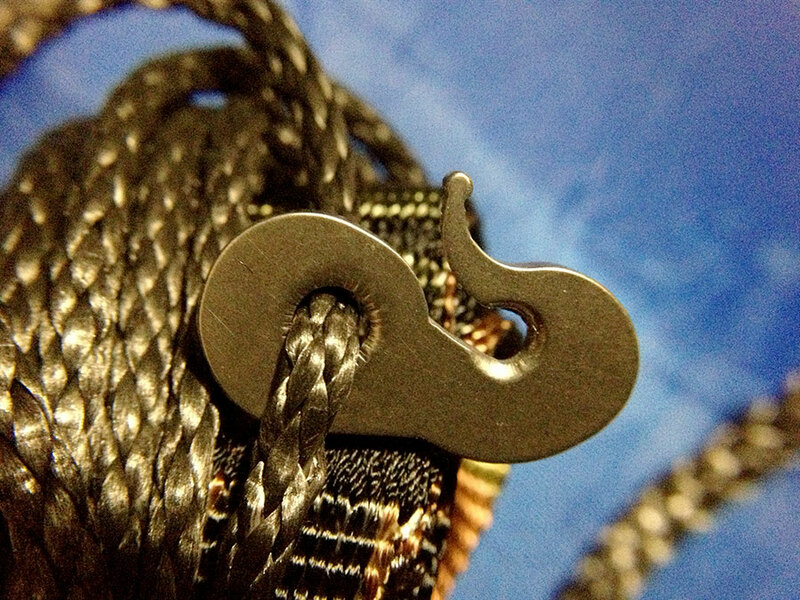 The soft shackle “carabiner” is a replacement for a full-size carabiner. Like the spliced eye, a soft shackle is a “knot” that is not meant to be taken apart. 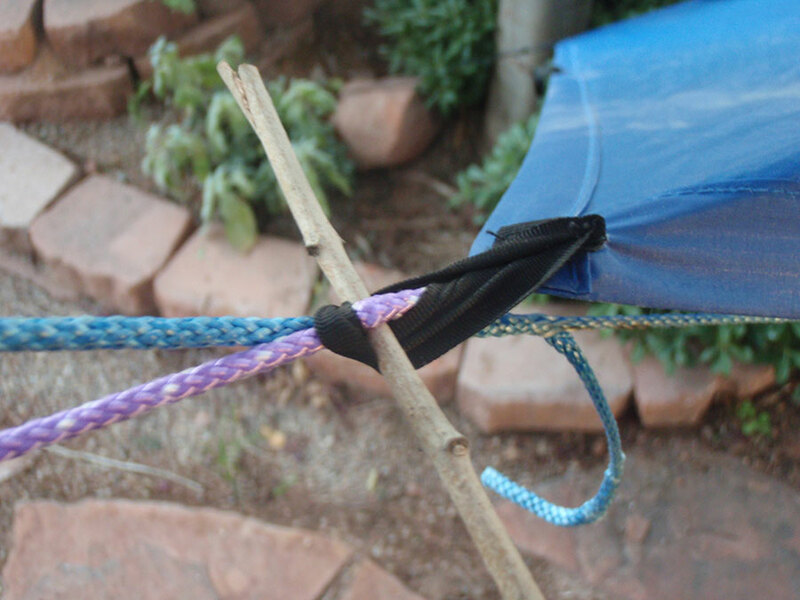 One way to use a Prusik knot: an adjustable connection point for a tarp. The titanium Whoopie Hookis another minuscule device that takes the place of a full-size climbing carabiner, often used to connect a hammock to a webbing strap. Simple, straightforward, strong. The titanium Tarp Flyz (4.5 g) are perfect for tarp ridge lines, providing 3:1 mechanical leverage to easily get a tarp taut with a quick, no-knot wrap. Toggles can also be used for load-bearing hammocks. In this example, the webbing spreads the load across the stick and helps focus compressive forces instead of bending forces, so the stick/toggle doesn’t need to be very big. The toggle replaces the need for a carabiner, but it is still a hardware item and very useful for allowing quick adjustment and easy pitching and take-down. Another toggle example, this time used to hold a tarp. This example isn’t as secure. In practice, I’d add a small loop and tie a prusik knot here, but the toggle represents a makeshift hardware device that is useful but isn’t carried. 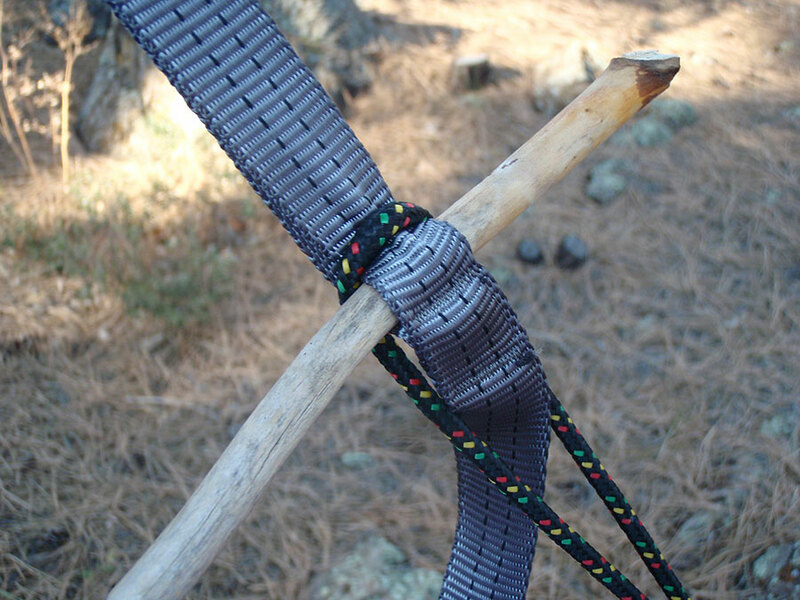 A stick toggle used to connect an under quilt to a hammock. Many folks opt for a small metal or plastic biner or clip, but a toggle works just fine. Technically, I’d consider a toggle “hardware” as it isn’t a knot. It’s super useful but doesn’t have to weight down your pack. The Dutch Clip, here in titanium, weighs 7 g, but more than make up for their weight by making it quick to connect/disconnect webbing strap. Now it’s your turn. Are you a knot guy, a gear head, or somewhere in between? What are your go-to knots? What hardware devices do you use regularly? Definitely somewhere in between for me. I LOVE my knots, but hardware (especially of the titanium variety) can be a lot of fun. I use Whoopie Hooks and Dutch Hooks on my hammocks and Dutch Flyz on my tarp ridgeline. I used to really like the tautline hitch and still use it in some circumstances. But, I’ve had it really tear up paracord under stress and almost cause more harm than good. I’ve looked to a few other knots (trucker’s hitch or other basic knots – or even hardware) for tarp lines because of that. Thanks Brian. I’m with you with ground tarps, etc. Hardware doesn’t play much of a part for me on tents or ground tarps. With hammock camping, hardware plays a bigger part, especially with suspension systems. Depending on what suspension system I’m using, I can get away without any hardware, but it really helps speed things up. I like the “quick start” method when I backpack, so finding little efficiencies here and there really pay off when I’m going light and fast. I’m also a real fan of the “pseudo” hardware: toggles. So simple, so straightforward, and something you can put together on site. All the advantages of hardware without the weight penalty. The bowline is the best knot ever! A bowline tied with paracord and a large load, can be difficult to untie sometimes. I leave a “tail” when tying the last part of the bowline, makes it easier to undo quickly. Alpine butterfly should make the honorable mention list. One of the most under appreciated and under used knots out there. Maintains near 80% of line strength. I absolutely agree on the Alpine Butterfly. It is extremely easy to tie and an absolutely fantastic way to tie a loop in the middle of a line – especially when that line will be used to hold linear weight. What I mean is; with the Alpine Butterfly the load is still directed in a straight line through the rope. A basic overhand loop pulls the rope at a 90 degree angle when loaded in a linear fashion. This significantly weakens the rope’s ability to hold a load. This is why the Alpine Butterfly is used for glacier travel instead of an overhand loop or even figure-8 on a bite. 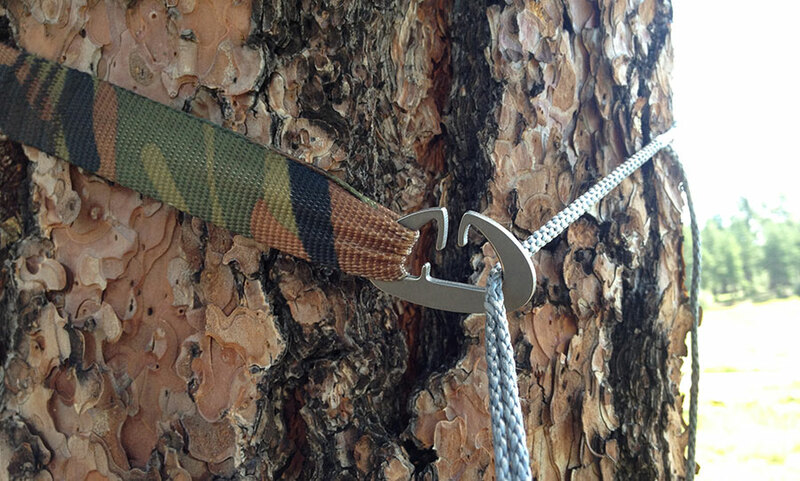 I also use the Alpine Butterfly as a gear loop in the center of my hammocks ridge-line because of its superior performance under linear tension. Love it! Great article! I have found the figure 8 workers better for my hammock than any knot I’ve tried. It holds without slipping but is easy to untie. I just run the rope through both ends of my tree hugger straps and start doing figure 8’s. I will do at least 4 complete figure 8’s and then tie off with a half hitch, I have not tried any of the hardware devices but could see where they would be handy. So, do you do a figure-8 follow through? I’m imagining what I do when climbing: tie a figure-8 near the end of the rope and leave adequate standing line. This standing line goes through the webbing and then I tie the follow through figure-8. Derek, it really only goes over the standing end and then is fished of with the half hitch on the standing end. Part of the figure 8 is going between the loops of the tree huger. Easier to show than explain so hhere is a short video on the Hennessy site that shows how to tie it. Okay, I understand what you’re doing now: the figure-8 lashing! Here I was thinking something more exotic 😉 the lashing works, but it is one technique I was referring to that is not easily adjustable. I couldn’t read the info on the hardware it disappeared too quickly … where else is this so I can actually comprehend what each piece is? The first two work and I could read what they are, but the next ones still flash by. could anyone recommend a good knot for shortening a length of rope? in other words if rope is tied from one tree to another but is too long, and re-tying it to the trees is not an option, what knot used in the middle could be used to take up the slack? Is this for a tarp or hammock? I know a sheep shank is used to shorten a rope, but I don’t think it works in your scenario. You could tie a truckers hitch in the middle, using the line as the pulley. I know this is very late for a reply, but in case somebody sees this and wonders what the answer might be (with one caveat): trumpet knot. Very similar to sheepshank, but you don’t need a free end to tie it. The caveat: you’ll be able to take up *nearly* all the slack, but you probably won’t be able to get something that is super taut. It would be nice if the text explanations of the hardware pics in the gallery stay together. I found myself trying to flash back and forth trying to catch a word of the associated text. The first couple of images have the text on the same page… So it can be done… Otherwise a great little article- thank you. I will go back and add an update. Yes, I’m also trying to read the text explanations with the pieces of stick you are using on the cords. Looks like something I could definitely use. Did you happen to update somewhere that I am missing. Thank you. What hammock do you have? A climbing carabiner is great for eliminating some knots or complicated lashing methods. 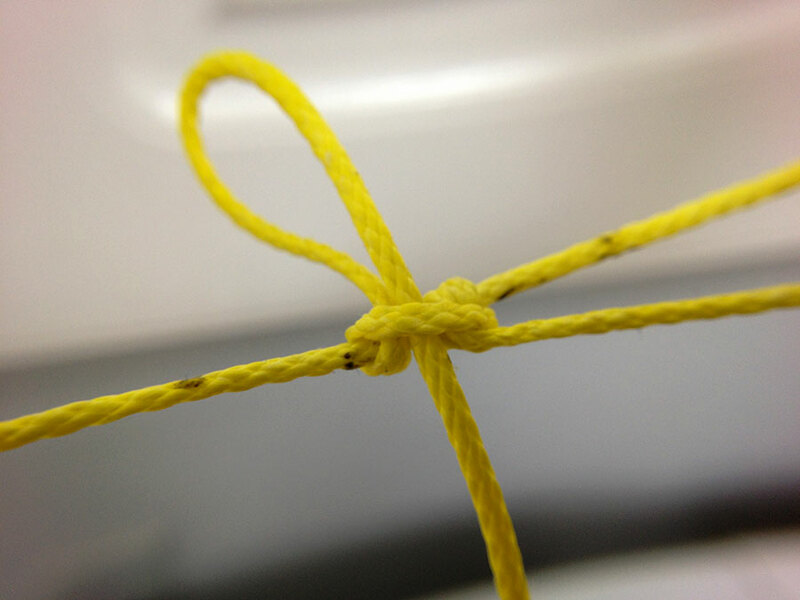 If you learn how to tie knots properly and practice using them then everything becomes so much easier. If like me your mind goes blank as soon as you see a piece of rope then hardware rules lol. Seriously I guess they both have a place and it really comes back to kowing how to use either option properly. I have read the description of the dutch hardware and it gives good details of them except for one factor which I feel is important and that is – what is the holding strength of each, or what weight can they withstand before breaking or deforming. If these are used for tarp suspension than there is probably no worry but what happens if you start using the tarp ridge line as a hangar for other things as well. Clothes line, hang sleeping bags, underquilt, water filters, packs, etc. Also staking the tarp down in heavy rain and/or high wind. Also some will try to use these for Hammock hanging or at least taught line ridge line for the hammock which will put stress on the hardware when they lay in their hammocks. I myself have thought about using these for that purpose and I know I would not be alone. The weight ratings are listed on the DutchWare website. The Whoopie Hook, for example, is rated at 1,000 pounds. Hey Derek, just finished your book which was very informative. I’m new to the hammock scene and just bought a Hennessy Expedition. Bought the gear to use the climbing rings to suspend the hammock from but after reading your book was interested in trying the Slippery Larks Head knot, just can’t find any directions on tying the knot. I’m working on a video that shows a few mods to the Hennessy. I’ll add that in. If you look up larks head knot you’ll find a lot of examples. To make it slippery, you just don’t pull the standing end completely through, leaving a bight or loop. Another good alternative is a clove hitch. It holds a little better and is just as easy to tie as the larks head; it just takes a different twist in the second loop. One of my favorite hardware setups is the sliding ring method. In my case, I use a climbing carabiner with a rounded spine. 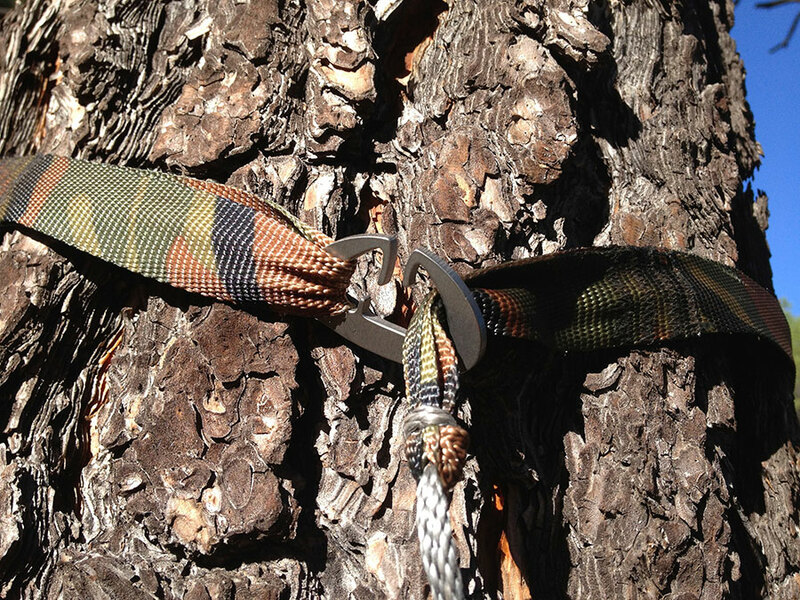 Going from the hammock to the tree huggers…..
midway down the line, place three wraps around the spin on the carabiner. Continue to the tree hugger and then return back toward the carabiner and hammock. Form a marlin spike hitch and use the carabiner as the “spike”. Slide the carabiner forward or back along the line to adjust tension. I am sure you have seen this Derek, but I wanted to spell it out best I can incase someone wanted to try it. Thanks Caleb! I’m not sure I’ve seen this one before, although it reminds me of a few. Please send me a photo. Hmmmmm…. any way I could get a copy of that photo? This sounds similar to something I’m thinking of for my set up. I’m in the Land of BIG TREES (Seattle, Western Washington) & the webbing on my DIY hammock is not quite long enough to get enough of the “Speer Wrapping” to hold. I’m thinking of running the webbing around the tree & then hooking back into the webbing with the same Marlin Spike & Carabiner that Caleb mentioned (my webbing is both tree hugger & suspension). What is a good tensioning knot to sub for the tautline on tarp lines? I have been using the tautline and I like the ease of adjustment with it, but reading folks above that the tautline will degrade the cord, thinking perhaps there is a better option? I’m not sure I agree that the taut line hitch needs to be replaced. All knots weaken rope to some degree but it takes a long while. A truckers hitch is another tensioning knot I use with guy lines. I love knots and grew up with natural fiber ropes and para cord. However, I really love zing it and lash it and the blue stuff. Some of my knots just will not hold. I have tried the traditional taught line with zing it with poor results. Does yours work well. I was using new zing it and it was slippery. 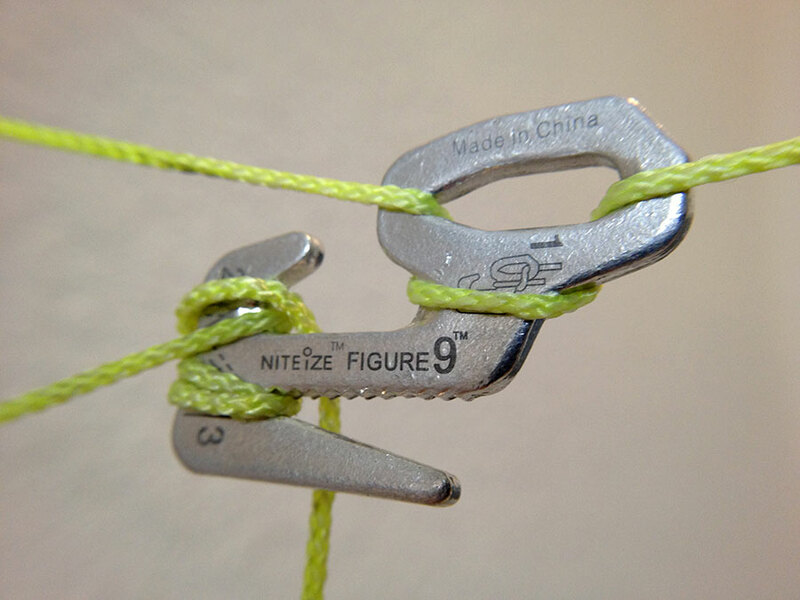 I will teach my scouts the traditional knots but maybe I should also teach them how to splice zing it. Any suggestions? Amsteel is slippery, and it is very difficult to get knots to hold, particularly if there is a lot of tension. I find that prusik or kliemheist knots hold well, so long as the rope used on the knot is smaller diameter than what it is tying to. Where I most often use Amsteel rope is on hammock suspension, ridge lines, and tarp ridge lines. I don’t use it on guy line, where I use my knots most often. Teaching splicing is a great tool, and could possibly count towards some Scouting merit badges like Pioneering. For a tautline alternative, look up cawley and farrimond hitches, IMO are better quick release. I believe that the tautline or any fiction hitch under tension would eventually begin to work the outer sheath away from the inner strands ie para cord. 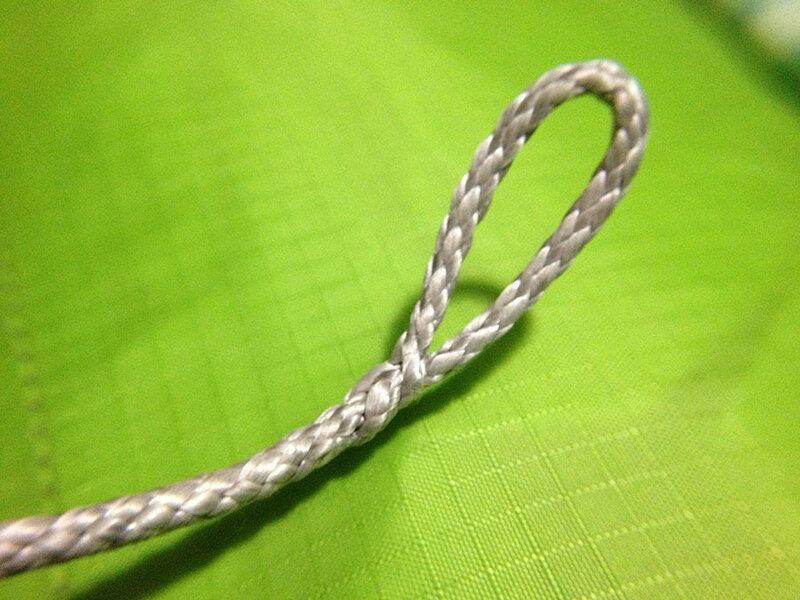 Do you spice your loops for prusik knots or tie the ends as is pictured in with the larks head? It depends on the material. Some line cannot be spliced because they aren’t hollow. But more often I just tie fisherman knots. It’s faster/easier. Excellent overview of useful knots, hitches and hardware. I encourage people new to camping tarps, hammocks and similar gear to become comfortable, competent with the basics that you recommend in your book and articles first. Then after a lot of practice with those learn to use time saving hardware and impoverished methods for when hardware is lost or not available. I have some H.W. from Dutch and Nite Ize but Titanium carabiners rated at over 500 lbs load are the most versatile for me, not strong enough for mtn/rock climbing but you can hang a hammock from or stuff like water bottles from front of backpack or canoe, bike and many other applications during the day with or without rope/webbing hitches. 9 grams each from vendors like Kieth. Multiple use saves weight, space and money. 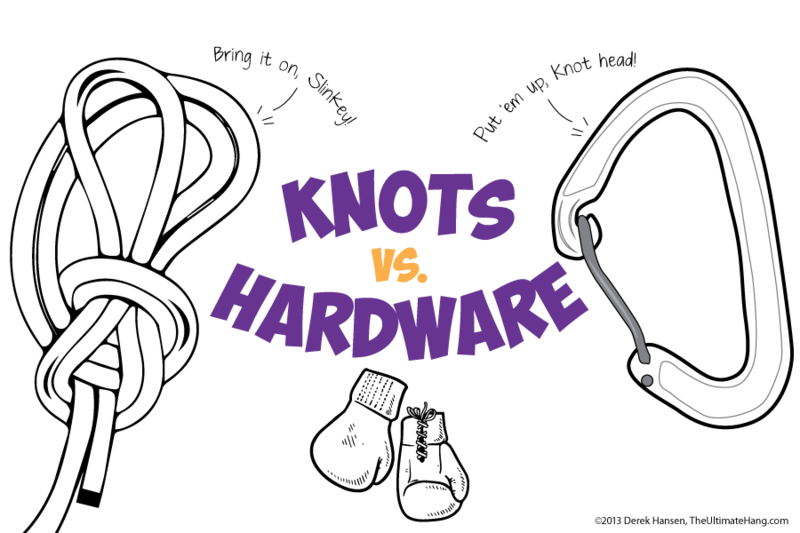 Knots vs. Hardware. Does one effect line strength more than the other? very sharp bends are weakest” (Fresh, 23). The greatest load is always on the first curve. So does the same apply to hardware. The first curve or bend of the line around a piece of hardware is severe compared to a knot. Does that make the line fail sooner on hardware? Your book which was very informative, I am new to hammocks and the book helped a lot. I am definitely in the middle. I use knots for pretty much everything, even my hammock. But when it comes to hardware, I can’t seem to get enough for climbing or backpacking. The people raising the question about braking strength of the rope compared to the first bend in the rope. As a challenge course manager, this is a real concern. If a rope is bent in half on one steel climbing carabiner, it can lose ~75% of it’s overall strength. If the rope is bent over two carabiners, it can lose up to 50% of its strength. I use sheer reduction blocks that bend the rope over a 1 foot area to minimize the sheer on the rope, allowing it to retain all of it’s strength. We also have redundant knots and carabiners to clip into participant harnesses. So, from my personal experiences, I like to use both knots and hardware. 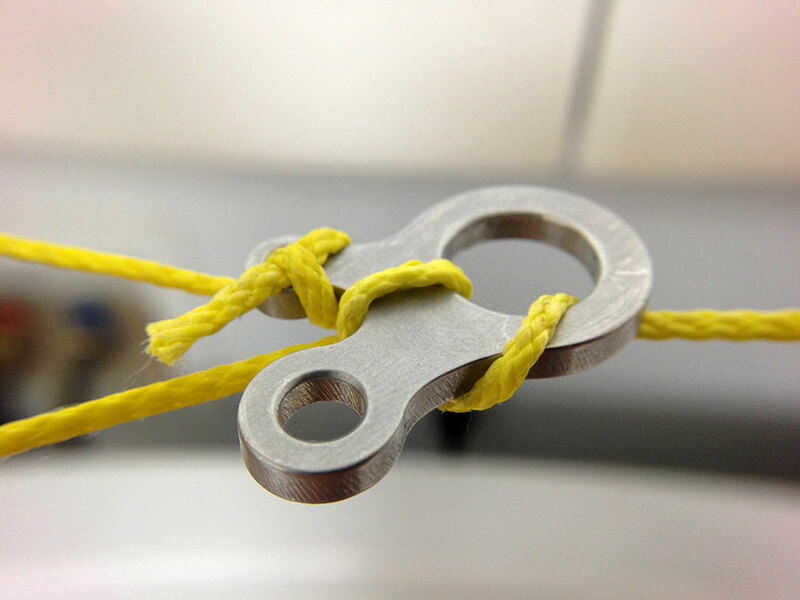 While hardware is really cool and easy to use, make sure you know your knots well as a back up for any situation. A good balance of both is the best way to go. Thanks Charlie. I agree: moderation and balance are important. Thanks for coming down to Tucson yesterday. Can you clarify the knot you tied on the carabiner with the Hennessey? You’re welcome Walter! It was great to meet you and the other participants. The knot we practiced was the slippery Becket Hitch. You can see a series of photos on this post, just scroll down. Thanks Derek. What about tying a Hennessey into a carabiner? Do you use a slippery Lark’s hitch? Slippery clove hitch. But if you want lighter, skip the hardware and tie a slippery becket hitch. For smaller diameter line on some Hennessy models, use a double Becket hitch. I use a stick “toggle” for another purpose. My setup uses simple 1″ webbing to connect to the tree. When I tie water knots in the webbing (to join the ends for one big loop, or to make a small loop at one end), I put a small stick into the knot so I can untie it easily. This works better than slipping the knot. Another knot I would add to the list is the timber hitch. One knot I love is the poachers or scaffold knot. 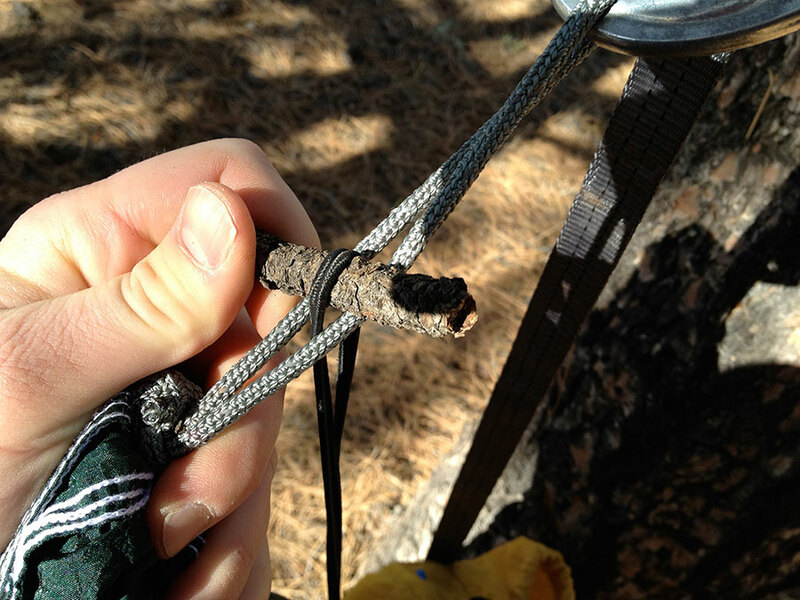 A sinching noose knot that with small pebbles you can make tie points anywhere on a tarp. Also ties sacks closed. That’s a good knot for sure. Not a lot of application for hammock use but still a good one to know. Derick, do you have illustration for making an eye splice with locked brummel? thanks. i am hooking a dutch hook on a piece of zing it for my tarp ridge line. I will in my upcoming book. Nothing right now. There are some good tutorials on YouTube in the time being. Sorry! CINCH BUCKLE …from Dutchware … man you can’t beat the price nor the ease of setting up your hang when using these….and…Dutch is a cool guy, and very easy to deal with. 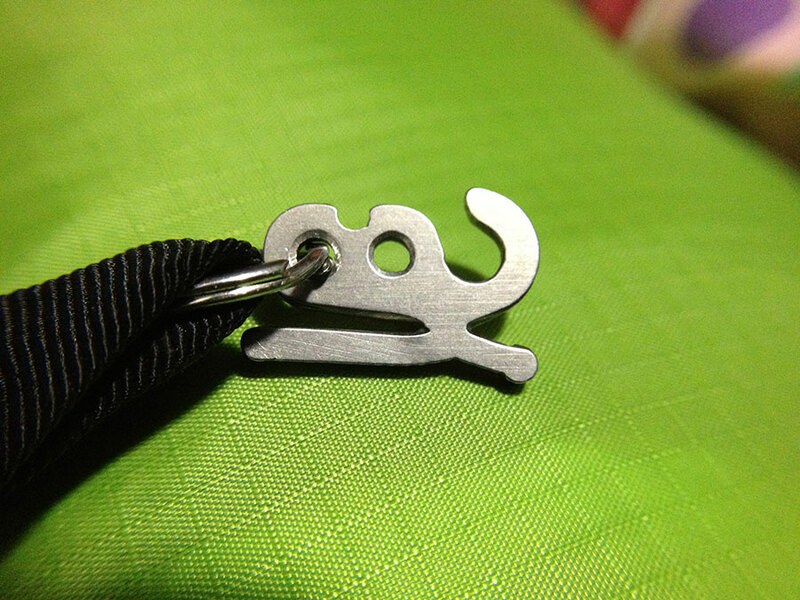 Just curious, what is the advantage of a Dutch clip over a common carabiner? It just doesn’t seem to offer anything new. The titanium clips are tiny compared to a biner! A climbing carabiner (Black Diamond neutrino) weighs 36 g compared with a Dutch clip at only 16 g.
I use wiregate carabiners that weigh only 24 grams and are more than strong enough, and I like the added safety that the gate offers over the Dutch clip. The difference in weight of 2 quarters isn’t significant to me, especially considering the huge cost increase for Dutch clips. But I guess that’s why there is such a wide variety in equipment… different strokes for different folks! Thanks for the info. Dutch clip versus Aluminum carabiner? Why do elite cyclists spend $5k to $25k or more on an ultra light weight special purpose bicycle when a cheap steel frame bike from the local Walmart would get them from point A to B just fine? Perhaps they want to go further faster? Perhaps they don’t weigh over 300 lbs? Dutch clips aren’t for everyone, they are only rated for 300 lbs. Very low bulk, also not the lowest weight, a knot is lower, found stick for MSH is lower, Dyneema soft shackle weights less. Everyone has different objectives and goals. Carabiner needs to be smooth for rapid decent when rappelling and many other purposes, but if used properly the webbing strap should not slid along the edge of a Dutch clip much at all, the sharp edge helps to hold it from slipping much like with a cinch buckle. To file it smooth would defeat some of its functionality. Please don’t rappel of the side of a mountain with a Dutch clip! Wrong tool for the task. Ummmm…. thanks… I guess? Of course, no one ever suggested rapelling with a Dutch clip. And I’d hardly compare a climbing-rated carabiner to a cheap WalMart bike. And I’d certainly not compare the good ol’ boys I’ve seen using Dutch clips to “elite cyclists”. As for the weight issue, I’ve never seen anyone over 200 lbs using a hammock, but maybe some do. That’s not a concern for me. But you do make one good point – the fact that carabiners are excellent for both climbing and hammocking, and Dutch clips are useful only for hammocks, makes carabiners an even more logical choice for me. I value multi-use gear over specialized, limited-use items. But like you say, it’s all about the individual’s objectives and goals. I absolutely love your stuff!!! I own your book and have read it many times. I also run cross country and at the meets, I love to hang my hammock with my friends. I want a fast and easy way. I was thinking to do a marlin spike hitch in the webbing and use the carabiner (holding up my hammock) as the toggle. So the toggle would be the weight bearing point. I would probably add a half hitch on top of that just to be safe. Does this sound like it would work? Thanks for all you do! Yes. That is a very common method. He Derek, one of my favourite hitches is the taut line (and it’s variants) because you can tension after tying. In my experience, though, it doesn’t work well with webbing. I can tie it, and then tension it, but it usually slips under load… so I end up tying a few half-hitches afterwards to minimize the slip. However, I’m not satisfied with this. Do you have a recommendation for a hardware-free webbing hitch that duplicates the functionality of the taut line? For a hammock? Try the Becket Hitch. For guy line, I like a modified truckers Hitch that Andrew Skurka uses.